We have landed on Mars!! I will try and keep you update as much as possible but for the most up to date news, here is the NASA website!! Science is always about questioning ... every time a child says "why" ... to my ears ... it is MUSIC ... because Science is at the heart of this!! 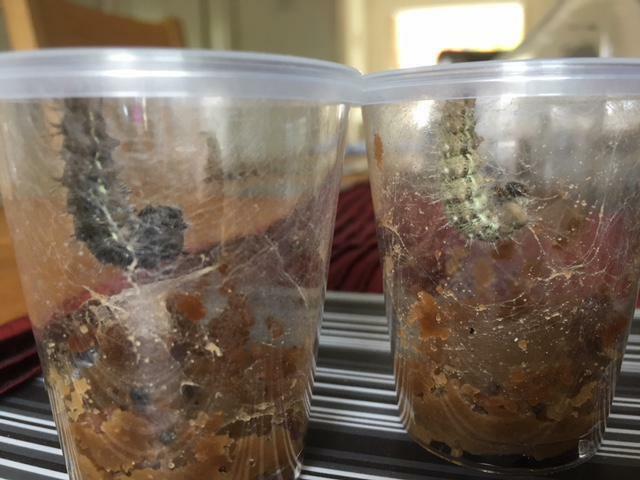 Year 1 have been looking after some caterpillars and during the half term break many exciting changes have been happening (thanks to the hotter weather for speeding up the transformation process)!! 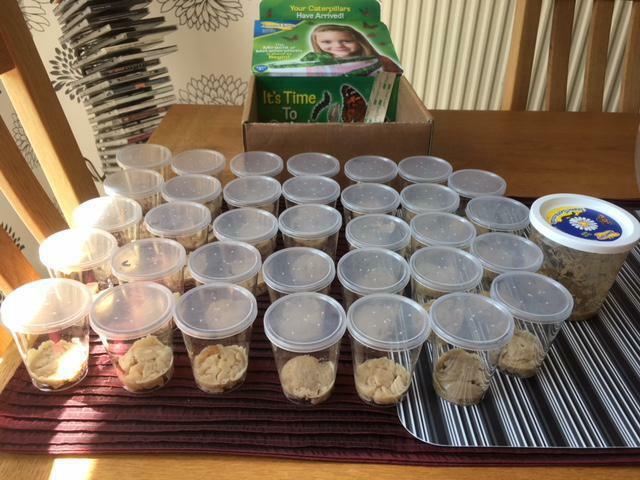 We received over 30 caterpillars and step one was to place them all into individual containers with some scrumptious caterpillar food. They were then left in peace and quiet so that they could eat and eat and eat and put on lots of lovely weight. 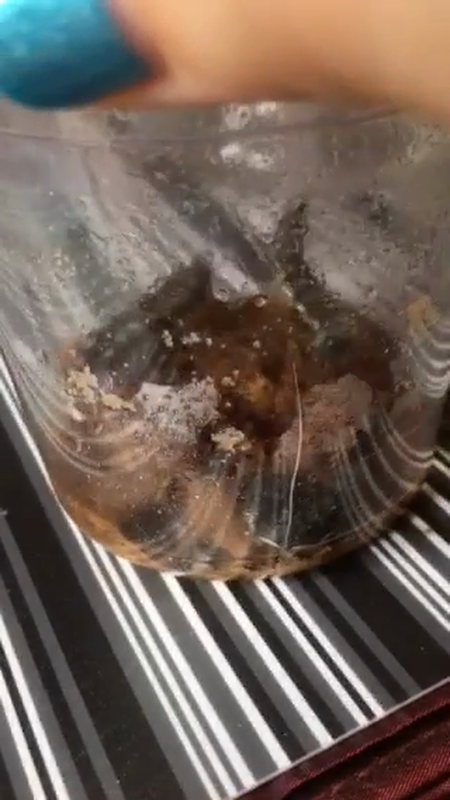 Within the vials you could see some webbing. This was a good sign because in nature this would protect the caterpillars from many dangers and they would also use this webbing to stick onto leaves so that the wind does not blow them off. Their final use for this webbing is to wrap themselves in leaves to protect themselves from predators that might like to eat them! 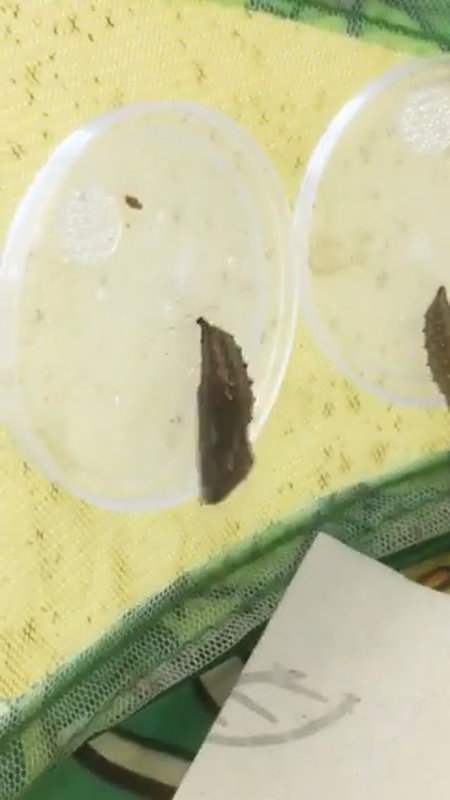 I have been in a couple of times this week and saw that they had started to climb to the top of the lid, turn themselves upside down into a "j" shape and shed their skin for the last time before turning into a chrysalis. 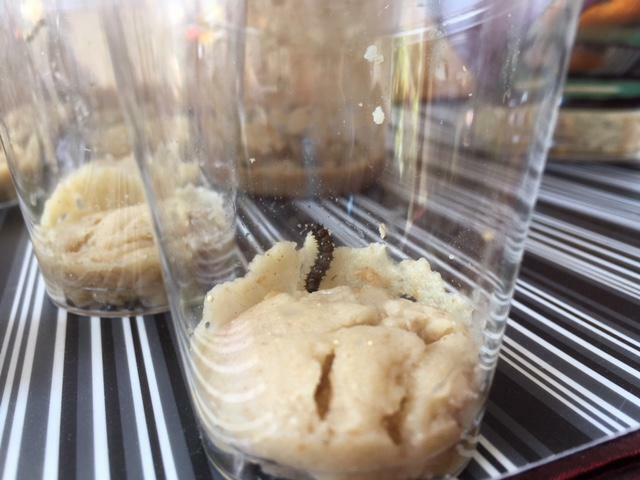 Today I went in to check on our little friends and they have turned into chrysalis'! A caterpillars skeleton is called an exoskeleton. The reason for this is because they are the opposite to us. We have our skeletons on the inside of our bodies and tissue on the outside. A caterpillar has the tissue on the inside and their skeleton on the outside. 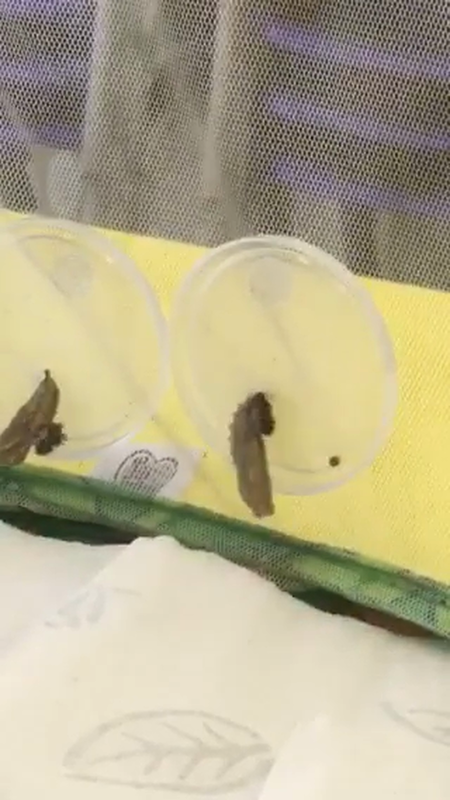 As a caterpillar grows this exoskeleton gets tighter and since it can not stretch they need to shed their exoskeleton in order to continue growing. 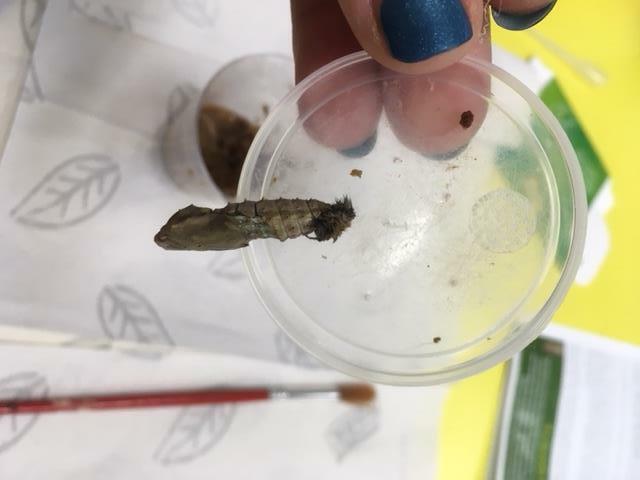 They do this 5 times before becoming a chrysalis and that's why we saw little black balls in the cups - they are little balls of cast-off caterpillar exoskeleton! 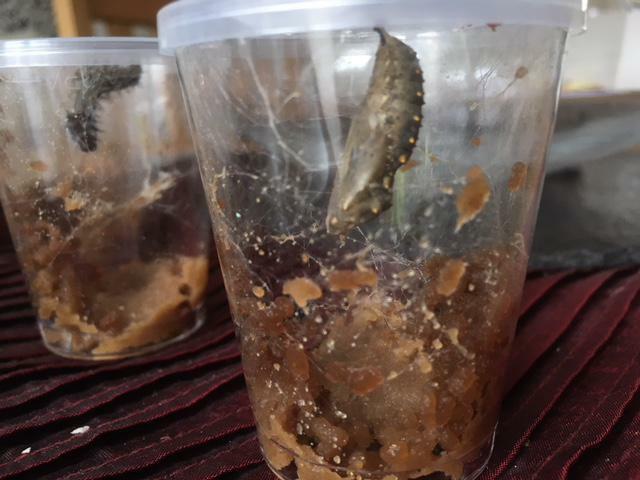 Today I transferred our little minibeasts from their pots onto the sides of the butterfly enclosure, they will stay here in peace and quiet until they are ready to hatch out of their cocoons! They decided whilst I was moving them that I may be a predator so did the wiggle dance and shimmy shake. This defence mechanism worked as I made sure not to disturb them again! Now we wait for them to change into beautiful butterflies!! I will keep you all updated on their progress. So for Science Club this term we will be focussing on how to improve the pond area within our fabulous school. The children have so many amazing ideas for how to improve the pond area and we are very excited about starting to make all of the changes! If you have any donations for example seeds, pebbles, stones, bark chippings, wood, solar lights, wind chimes, outdoor paints, bird food and bird feeders, or anything else that you can think of to make the area a special area for the children then please come and see me (Mrs Cleary-King) at any time! We will be creating a plan and this will be in my window (Cherry Class) if you are interested about what we are doing. We will also be updating you on the website and via the school newsletter. Welcome to Science Club!! We will be keeping you updated on all of the exciting experiments and new facts we learn in Science Club this term with photos and videos to add to the electric atmosphere on a Thursday after school. As an introduction to the club we watched some videos to see what kinds of experiments we would like to do. Once the children had made a list for me to look through we went outside and made a soda shoot. We added mentos to coke to see what would happen and the coke exploded. It was amazing fun! The Science behind this is ... fizzy drinks contain dissolved carbon gas, which is what makes them fizzy. Microscopic pits on the surfaces of the mints provide nucleation sites for the carbon gas bubbles to form much more quickly than normal. So many bubbles form very quickly and the drink jets out of the bottle. This week we made slime. It was rather messy, we added corn flour to water and food colouring, when we pushed it, it was hard but it looked like a liquid! It was very strange! The Science behind it: It is made of polymers, these are simple molecules called monomers and they are arranged in long chains. When these chains are stretched the liquid flows out but if you apply pressure the chains stick together making it behave like a solid. This week we explored all of the electrical equipment, we made circuits where the bulbs lit up. We created motors, parallel circuits and series circuits and some of us even tried to draw what our circuit looked like using accurate circuit symbols. This week we made fizzy fountains. 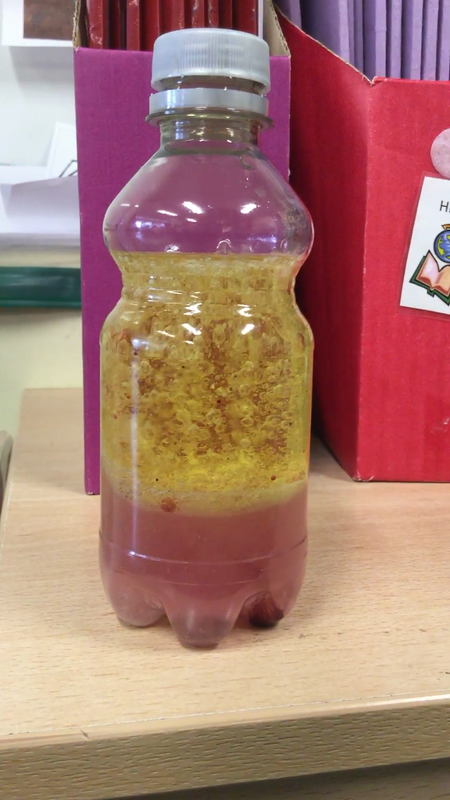 We added water to oil and a little food colouring then we dropped in an effervescent tablet. We were extremely excited to see the bubbles rise through the oil. Now for the Science ... When the tablets start to dissolve in the water, they begin to fizz. This CO2 gas forms the bubbles that rise up through the bottle. Water is more dense than oil, but when the bubbles attach themselves to the water, the bubbles and water are less dense than the oil, so they float upwards. At the top the bubbles pop and the blobs of water sink back down again!! On Saturday 18th November 2017, Vigo Primary School Choir were invited to sing at St Mary's Church Christmas Fete.